Removing dust mites from your infested linens, carpets, or curtains is not a simple task. This article will overview the options available including chemicals and heated washes of infested items. We will update this article regularly as new methods are discovered. There are some facts that you should familiarize yourself with, concerning dust mites, before going through the hard task of removing your home of the pests. For starters, dust mites don't survive in a relative humidity below 50 percent; they don't like places where it's very dry. Also, can be 100,000 dust mites living in a square yard of carpet, because each egg-laying dust mite can lay about 25 eggs every three weeks. We have just listed a few of the facts known about dust mites, and for more information concerning dust mites visit our Frequently Asked Questions page. One of the simplest ways to kill dust mites that have infested your bed linens is to wash all your linens in hot water that is above 130 degrees, but anything less than 130 degrees Fahrenheit will not kill the mites. You should wash your curtains weekly using the same method. Dry with the highest heat setting. There is an alternative method for killing dust mites which involves freezing them. You can place your pillows and some of your children's stuffed toys in the freezer for about a day to kill dust mites. You must wash anything you froze to remove the residue which will still cause allergies. It is noted that low levels of humidity and extended exposure to sunlight will also kill dust mites that have infested your home. If you have a fabric doormat, then we suggest that you place it outside weekly into direct sunlight. Buy a humidity gauge and a dehumidifier to keep humidity under 30% in your home and never worry about dust mites again. Clean the dehumidifier regularly to prevent mold build-up. If the dry air irrates your sinuses, use a saline spray to cope. If you have children (or pets), make sure their stuffed animals are washable. These plush toys are hotbeds for dust mites. If washing them is not a possibility, seal them in an airtight bag for 48 hours to kill the dust mites. Following this, shake or beat the toys outdoors to remove the dead waste which can still cause allergies. Removing carpet is another solution to getting rid of dust mites. 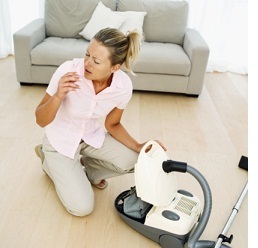 If this is impossible, steam clean carpets regularly and spray them with anti-dust mite chemicals (see below). There are naturally occurring and synthetically made chemicals that kill dust mites. We will overview the man-made alternative used to kill dust mites; the chemical used to kill them is well known, because it's a popular food addictive called "benzyl benozoate" (an aracacide). According to studies that have been conducted, benzyl benozoate doesn't cause any side-effects. You may have to order sprays or powders from speciality supply stores to get access to aracacides. There is also a namebrand solution to killing and eliminating dust mites, and it's called "The Ecology Works® DustMite and Flea Control". In studies conducted by universities, the product has been shown to be very effective in lowering dust mite population in a treated area to almost non-existent levels. Just by diluting the chemical solution with water and spraying it on carpet provides enough protection for up to 6 months from dust mites. As you can see, there are many ways to kill dust mites and many ways to prevent them from coming back.